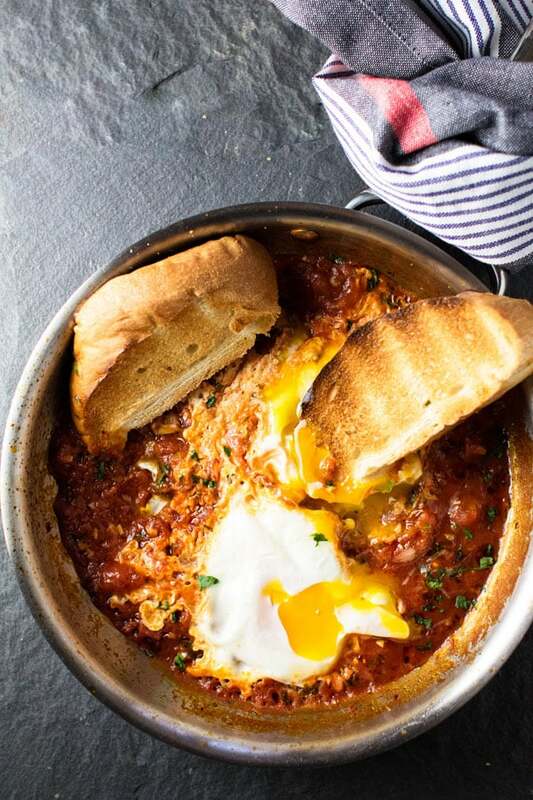 Eggs in purgatory is a fast and warming comfort food. Eggs are poached in a spicy sauce and served with bread on the side. It’s a delicious way to stay warm in the winter. A fiery marinara sauce, poached eggs with velvety liquid yolks, and toasted bread. This, my friends, is eggs in purgatory, otherwise known as my new favorite mid-winter dinner. 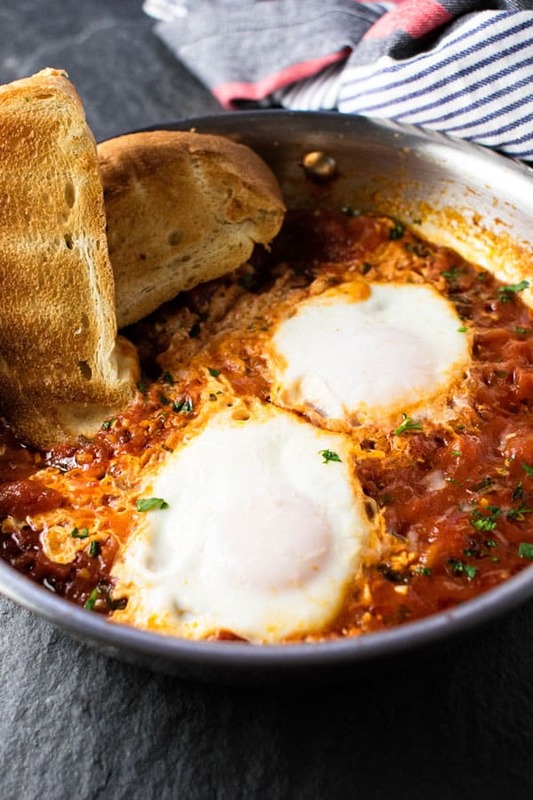 And while the eggs are suspended in the fiery depths of tomato sauce purgatory, the person who takes 15 minutes to whip this up will find her/himself in heaven after the first bite. I won’t go as far to say I had a religious experience making this dish, but, whoa, it was good. In other sort-of-related news, my cell phone died leaving me in an uncomfortable space that comes from being brutally cut-off from a severe addiction. Like the eggs, I was suspended in cold-turkey purgatory when I realized the only phone number I have memorized is my mom’s rendering my house phone almost useless. A house phone I got just in case my cell phone died, yet never took the time to input important numbers. My New Year’s resolution? Update old-school address book pronto. And while I realize the grown-up response to a cell-phone-lost situation is to embrace the new-found freedom from constant connectivity and pursue higher-consciousness living, my true self thinks, “nope, ain’t gonna happen” while I hit the refresh button on my email every five minutes with desperate hope the replacement has shipped. As is my way during trying times, I turned to my stove for comfort. As I grieved my temporary loss of texting, Candy Crush, and general connectedness with the outside world, I simmered a small pan of sauce made with chopped tomatoes, garlic, olive oil, basil, and red pepper flakes. I slid two fat slices of bread in the toaster and cracked two eggs into the bubbly sauce cooking them just until the whites set and the yolks transformed into golden pools just begging to mix into the spicy sauce. I mopped it all up straight from the pan with the toasted bread and said a little prayer of thanks — eggs in purgatory is a comforting winter warmer for a lost and cellphone-less soul. 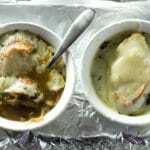 French Onion Soup made easy with a slow cooker! Beef Bourguignon is a winter classic. Braised Meatballs with Buttered Noodles is a hearty and comforting cold weather dinner. 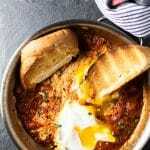 Eggs in purgatory are so simple to make and are best served on a cold night with plenty of crusty bread on the side. Heat the olive oil over medium heat in a small skillet. Add the red pepper flakes and garlic, stirring for a minute or so until fragrant. Add the chopped tomatoes, salt and basil. Stir and bring the sauce to a strong simmer. Crack the eggs open and slip them onto the sauce. Cover the pan and let the eggs cook just until the whites are set. Keep an eye on them as they will cook fast – it should take less than 5 minutes. Sprinkle grated Parmesan over the top of the sauce and eggs. Serve with toasted bread. Start with 1/4 teaspoon of red pepper flakes and give the sauce a taste. If you like it a little more fiery add more to your taste. During the winter, when fresh basil is sad and limp in the grocery store, I buy tubes of pureed basil which are near the produce section. delicious! i’m going to be addicted to this i can tell and it was so fast to make! This! I have to remember to try it. We go through eggs quite a bit in this house since they’re easy to make and everyone likes them. 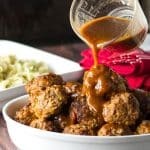 I’ll probably adjust the heat slightly for the toddler, but otherwise, I think this comfort dish would go over very well. Yum! Haha I totally understand the phone thing, and the eggs sound so good, I love eggs and finding new and easy ways to cook them is always good. Great recipe. I have to tell you I loooove poached eggs but have always been scared to try them myself, it’s my “going out to eat” treat. This makes me feel like I can do it! It’s so, so good, Jack!